Decision: Should I play Horrifying Armour? Horrifying Armour reduces an enemy fighter's chance to hit, while increasing the chance that the hit will kill your fighter. In order to be playable, the upgrade must provide a net benefit - opponents' fighters must miss your fighter enough times to make up for the lost wound. Additionally, this benefit must be great enough to justify spending a glory point on. The table linked below calculates the average damage output for every basic attack (those printed on fighters) in the game, before defense, at the time of the Eyes of the Nine/Gitz release. -There are 7 basic attack actions that can't be affected by Armour at all - 1 die attacks are quite rare. -There are 33 basic attack actions that have a range of more than 1. For the purposes of this calculation, it was assumed that the enemy model will use these attacks at a range that negates Armour's bonus. -Attacks with fewer dice are hampered more by Armour than those with more dice. -Attacks that do more damage are hampered more by Armour than those that do less damage. What the data can't account for, however, is the frequency with which various attacks are performed. However, we can assume that a smart player will tend to favor high accuracy, high damage attacks in most situations. In general, Horrifying Armour will be more effective against these kinds of attacks than weaker attacks. Fighters have varying numbers of wounds. Upgrading Gurzag with Horrifying Armor reduces his wounds by 20%, while a Petitioner loses 50% of its wounds to the same upgrade. Who benefits more? Let's take a look at some scenarios. 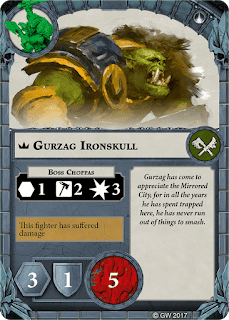 There is no unmodified basic attack in the game that can kill Gurzag in a single hit. When Gurzag puts on the Horrifying Armor, however, the Blazing Latchkey Axe is suddenly lethal. Since this attack only loses 25% of is its accuracy to Horrifying Armor, we can safely say that Gurzag is worse off in this situation. 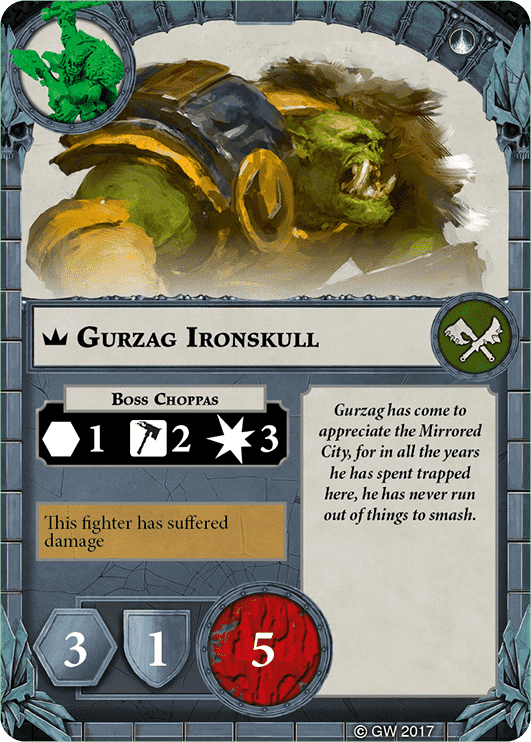 On the other side of the coin, Gurzag can take five 1 damage attacks before dying. Horrifying Armour reduces that number to four. The reduction in hit chance to the 1 damage attacks would need to be more than 20% on average to justify Gurzag armoring up. 2 axe and 2 sword attacks that deal 1 damage both lose more than 20% of their chance to hit from Armour, while 3 axe and 3 sword attacks lose less than 20%. Since the 2 die attacks are more common, this situation does actually represent a slight improvement for Gurzag. 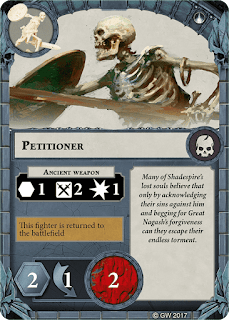 The Petitioner, on the other hand, already dies to most attacks. The Armour's wound reduction brings him into range for 1 damage attacks, which make up 59 of Shadespire's 141 basic attacks. This vastly increases the chances that Petitioner will die to a subpar attack. However, the wound reduction doesn't make Petitioner any weaker against the other 82 attacks. They killed him outright before, and they still do after equipping Armour - but he is less likely to be hit by many of them. 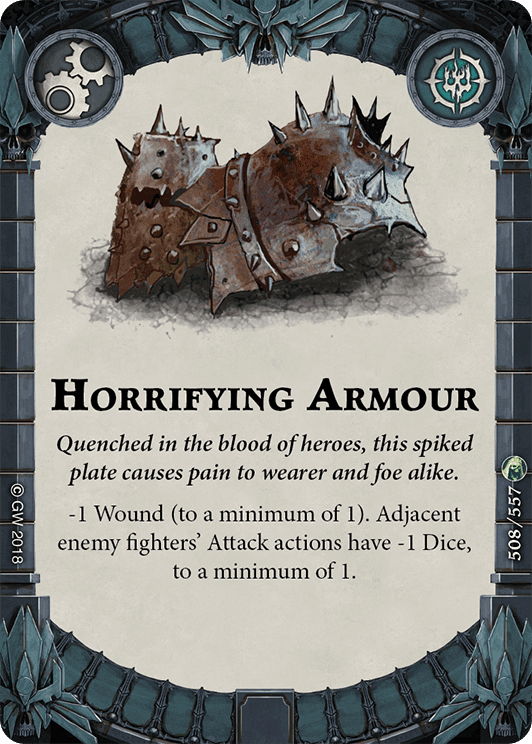 For Sepulchral Guard and Spiteclaw's Scavengers players who want to focus on stacking upgrades on a single 2 wound model, Horrifying Armour may be worth considering if you have free slots. Depending on the meta where you play, you may see players focusing using upgrades and ploys to reach a certain "benchmark" level of damage on most attacks. Many aggressive decks currently seek to have the capability to do 3 or 4 damage with nearly every attack. This kind of meta can help inform your decision about whether or not to play Horrifying Armour. If everyone is trying to do 4 damage per hit, playing Horrifying Armour on a character with 4 wounds becomes more appealing. If your meta tends to focus on doing 3 damage, however, playing Armour on 4 wound fighters becomes a very bad idea. Horrifying Armour doesn't directly affect the number or type of defense dice rolled. However, it does directly affect the number of times you need to roll any successes at all to defend. If your opponent doesn't roll any successful attack dice, you're automatically safe. Therefore, warbands that have weaker defense stats will garner more use out of Horrifying Armour than those with stronger defenses. Up until this point, I've been focusing solely on Horrifying Armour's effect on the model that's upgraded. However, it should be noted that the Armour actually affects all attack actions by models who are adjacent to the upgraded fighter. If I can keep my upgraded fighter next to a bunch of enemy models, their accuracy drops significantly even when attacking my other fighters! But how helpful is this? We can't accurately predict the actions of our opponents. However, I would say it is safe to assume that your opponent will prioritize taking out the upgraded fighter, rather than allowing him to passively reduce multiple attacks on other fighters. When used in this way, Horrifying Armour may serve as a good way to force an opponent's targeting. Additionally, stacking multiple defensive upgrades on the model with Horrifying Armour may prove a useful strategy, especially for Sepulchral Guard and Spiteclaw's Scavengers. 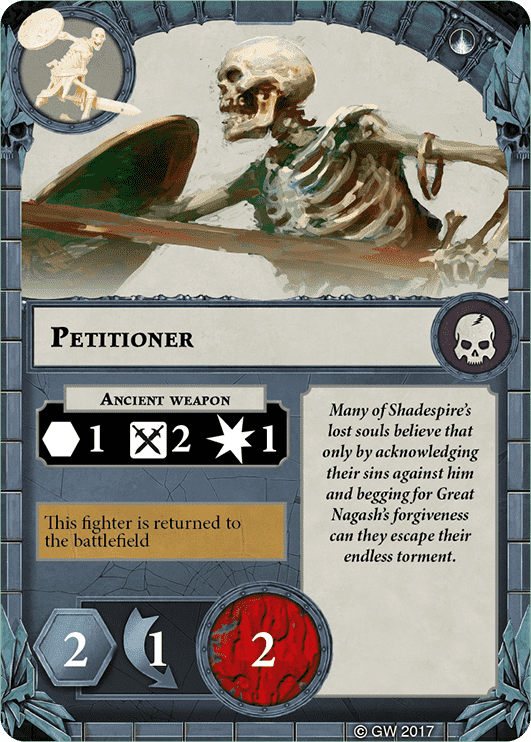 It's hard to quantify how useful this is, but having an essentially immortal fighter who sprinkles -1 dice penalties around seems like it might have a place in some niche decks. Cursed Artefact offers a good comparison to Horrifying Armour in that they both have the same costs: 1 glory and 1 wound. In terms of effectiveness at avoiding attacks altogether, Armour is the clear winner, as it increases the number of times your opponents' attack roll is completely unsuccessful. Horrifying Armour also reduces the number of successes your opponent can get on a successful attack, therefore reducing the number of successes you need to deflect the attack. -The more defense dice you roll, the less you are helped by Cursed Artefact. Since most attacks outstrip most defenses in terms of dice rolled, it would appear that Cursed Artefact is generally better. 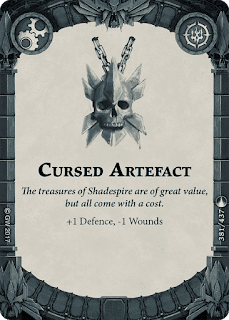 Additionally, Cursed Artefact is effective in all situations, whereas Horrifying Armour provides no benefit against attacks from non-adjacent models or against attacks that only roll one die. 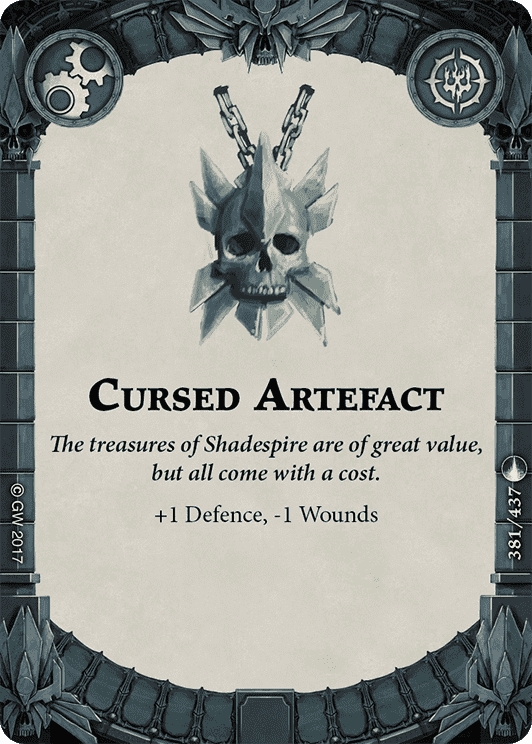 According to these guys, who seem to have a pretty good grasp on practical defense, Cursed Artefact is near the bottom of the list for defensive improvement. And it would appear that Horrifying Armour is strictly worse. Also: screw GW for "Artefact" and "Armour." Murika! For Horrifying Armour to be "worth it," we would expect it to give not only a better chance of survival than having no upgrade, but to give a better chance of survival than at least some similar defensive upgrades. Unfortunately, this is simply not the case in most instances. There may be an argument for edge case use as a method to force targeting, or in decks that stack defensive upgrades deeply. So the Call It Shadespire playgroup headed out to play in the Las Vegas Open last weekend, and this article will focus on our experience there! Factor: The People I want to start out by saying that the people playing Shadespire at the convention were - universally - awesome. Everyone there seemed out to have a good time, and all of my matches were fantastic, no exaggeration. I'd like to give a special shout out to the Canadians there - especially Sam, Justin, and Kaptain Murder - who were all friendly to the Albuquerque crew, even putting up with our appropriation of Canadian culture in our team names (on Friday we were LETTERKENNY, on Sunday we were DIRTY DANGLES). My opponents were all super cool, and I honestly had a blast every single game. It's been a long time since I played a tournament and didn't have a single game that felt bad. TL;DR = Against warbands that lack cleave and roll relatively few attack dice (especially Swords), Ethereal Shield is a good option if most of your fighters dodge. Against warbands with cleave, or those that roll very high numbers of attack dice (especially axes), there are better defensive options.